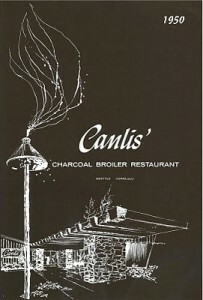 So many in Seattle are atwitter with Canlis’ menu contest. And rightly so. In hiding 50 menus in 50 days (Sundays off, generally), Canlis is providing 50 lucky Seattleites the chance to dine (with a guest) at 1950s prices. It’s all part of Canlis’ 60th birthday celebration. The contest is brilliant on many levels. First, the clue-giving is a fantastic use of social media. Second, it’s intellectually stimulating, as the answers often emerge from riddles, plays-on-words, etc. Related to that, the contest connects Canlis and all the contestants (and that’s anyone) to Seattle, teaching a lot about regional history in the process. And finally, it’s hip, bringing a new generation of fans into the Canlis fold. That last one was my favorite: a crème fraiche parfait. With all its savory elements (why don’t more desserts incorporate savory elements? ), it reminded me of the fabulous desserts I ate at Portland’s Fenouil last summer. (Pastry chef Kristen Murray has since moved to Paley’s Place.) Just some of the elements: the tube of parfait with wasabi and grapefruit glass on top, candied almonds, olives, fresh grapefruit and grapefruit gel, celery root and cream, candied grapefruit peel in simple syrup, and fresh shiso. Like my whole meal at Canlis, I found this dessert to be creative, playful, sophisticated, thought-provoking–and absolutely delicious. First published on TheSunbreak.com on November 17, 2010.